Invalidation or activation of LXRs alters myelin structure and myelin gene expression in the cerebellum. (A) Low magnification of cerebellar WT and LXR dKO electron micrographs. (Scale bar, 2 μm.) (B) High-magnification electron micrographs of a representative axon and its myelin layers. (Scale bar, 50 nm.) (C) Myelin thickness estimated by g-ratio (mean ± SEM, 3 animals per group; **P < 0.01 by t test). (D) Quantitative RT-PCR of WT and LXR dKO cerebellar RNA with primers recognizing PLP, MBP, or ABCA1 (positive control) normalized with GAPDH (glyceraldehyde 3-phosphate dehydrogenase) (mean ± SEM of n = 5 animals per group; **P < 0.01 and ***P < 0.001 by t test). (E) Western blots from WT and LXR dKO cerebellar proteins using anti-PLP and anti-MBP antibodies normalized with β-actin (mean ± SEM of n = 4 animals per group; **P < 0.01 and ***P < 0.001 by t test). Pictures represent a typical experiment. (F) Quantitative RT-PCR of cerebellar RNA from WT mice force-fed with TO9 or vehicle (veh) with primers recognizing PLP, MBP, or ABCA1 (mean ± SEM of n = 5 animals per group; *P < 0.05 and **P < 0.01 by t test). (G) Western blots of cerebellar proteins from WT force-fed with TO9 using anti-PLP and anti-MBP antibodies normalized with β-actin (mean ± SEM of n = 5 animals per group; *P < 0.05 by t test). (H) Cerebellar RNA from LXR dKO force-fed with TO9 as analyzed in F. Credit: Meffre, D et al. (2015) Liver X receptors alpha and beta promote myelination and remyelination in the cerebellum. Proc Natl Acad Sci USA 112:24 7587-7592. (Medical Xpress)—Myelin is an electrically insulating layer, or sheath, made of protein and fatty molecules, and synthesized by cholesterol-rich oligodendrocytes, that forms around neurons and allows electrical impulses to propagate rapidly along the axon. (Oligodendrocytes are glial cells – non-neuronal cells that maintain homeostasis, form myelin, and provide support and protection for neurons in the central and peripheral nervous systems.) The myelin sheath is critical to normal central nervous system behavior, but oligodendrocyte cell death or injury can lead to demyelination, which if not followed by normal remyelination typically leads to axonal degeneration, functional impairments, and clinical disability. Taking a novel approach to the myelination and remyelination processes, scientists at Paris Descartes University studied Liver X Receptor, or LXR, isoforms LXRα and LXRβ – oxysterol-activated proteins able to modulate gene expression – to investigate their possible role in the myelin physiology of the cerebellum. (Isoforms are any of several different forms of the same protein.) They found – for the first time – that mice genetically invalidated for both LXRs exhibit alteration in motor coordination and spatial learning linked with myelination deficits, and moreover demonstrated that LXRs intervene both in oligodendroglial cell maturation and in the transcriptional control of myelin gene expression during both myelination and remyelination processes. 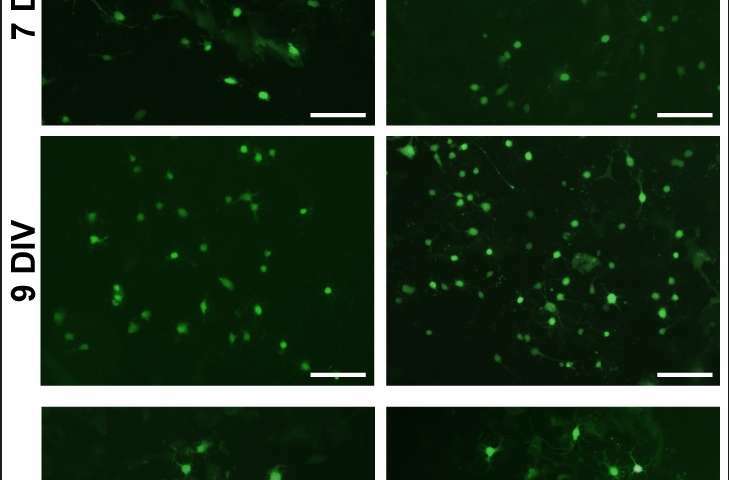 The researchers state that their findings could potentially lead to the development of pharmacological and translational therapies for conditions resulting from demyelination, such as multiple sclerosis. Prof. Charbel Massaad and Dr. Delphine Meffre discussed the paper that they and their colleagues published in Proceedings of the National Academy of Sciences. "In this study, we were the first to characterize the implication of the LXR isoforms LXRα and LXRβ in myelination using behavioral, histological and molecular strategies," Massaad tells Medical Xpress. "To assess the role of LXRs in nervous system myelination, the scientists showed that transgenic mice lacking both LXRα and LXRβ genes, and thereby genetically invalided for both LXR isoforms, exhibited motor coordination and spatial learning defects that can be related to cerebellar dysfunction. (The cerebellum is the part of the vertebrate brain that coordinates and regulates muscular activity.) "In studying the structure of the cerebellar axons by electron microscopy, we observed thinner myelin sheaths around them, which suggested alteration in the myelination process – and indeed, myelin gene expression was altered in the transgenic animals." Meffre notes that in some pathological conditions, myelin sheaths can be destroyed – a process known as demyelination – which then activates remyelination to generate new oligodendrocytes that will invade the injured region to create new myelin sheaths. In the case of demyelinating diseases such as multiple sclerosis, however, the remyelination process fails. "We investigated the role of LXRs in remyelination process specifically in the cerebellum. For that purpose we cultivated some cerebellum slices and studied remyelination after chemical-induced demyelination. Interestingly, when we activated those receptors with either natural or synthetic ligands" – molecules that bind to others – "the remyelination process was greatly improved." Furthermore, when LXRα and LXRβ are no longer expressed, the researchers showed that remyelination was impaired, demonstrating the direct role of these receptors in remyelination. As part of these discoveries, the scientists provided evidence of a new LXRα and LXRβ role in the cerebellar myelin physiology by demonstrating that LXRs intervene in oligodendroglial cell maturation. "Oligodendrocytes produce multiple membrane extensions that emerge from their cell bodies to enwrap and myelinate several axons." Meffre continues. "As oligodendrocytes maturate they undergo morphological changes with the emergence of multiple branched processes. Therefore, using in vitro cultured oligodendrocytes we showed that LXR activation by pharmacological agonist strongly promote branching processes. Moreover, the expression of myelin genes involved in cell maturation shifts from oligodendrocyte precursor cell-specific myelin genes to myelin genes specific to more highly differentiated oligodendrocytes under LXRs activation. LXR activation accelerates remyelination in organotypic cerebellar cultures. Control (vehicle) and lysolecithin-demyelinated cerebellar slices were treated for 3 DIV with EtOH, TO9, or 25-OH. After (A) double immunostaining for MBP and CaBP and confocal acquisition, (B) axon number and (C) percentage of myelinated fibers were quantified (***P < 0.001 by ANOVA and Tukey’s post hoc test; n = 18 animals per group). (Scale bar, 20 μm.) (D and E) Quantitative RT-PCR with primers recognizing PLP, MBP, and ABCA1 normalized using 26S (mean ± SEM of at least three independent experiments performed in duplicate; *P < 0.05 by t test). (F) Western blots for PLP and MBP normalized with β-actin and reproduced at least in three independent experiments (mean ± SEM; *P < 0.05 and **P < 0.01 by t test). (G) Control (vehicle) and lysolecithin-demyelinated organotypic slices treated with EtOH, TO9, or 25-OH. After immunostaining for Nkx2.2, numbers of immature oligodendrocytes were quantified with ImageJ (n = 12 animals per group; *P < 0.05, **P < 0.01, and ***P < 0.001 by t test). Representative micrographs are shown. (Scale bar, 50 μm.) (H) Control (vehicle) and demyelinated organotypic slices treated for 3 DIV with EtOH, TO9, or 25-OH and doubled immunostained for Caspr and MAG. A 5× magnification of a single Caspr cluster (pointed by the open arrowhead) is presented in each picture. (I) Number of Caspr clusters, (J) internode lengths, and (K) node lengths measured using ImageJ (means ± SEM; *P < 0.05, **P < 0.01, and ***P < 0.001 by t test). Credit: Meffre, D et al. (2015) Liver X receptors alpha and beta promote myelination and remyelination in the cerebellum. Proc Natl Acad Sci USA 112:24 7587-7592. In addition to myelin sheath deficits in LXR-invalidated mice, the scientists also showed that the expression of myelin genes is decreased in their cerebellum. Moreover, the in vivo administration of a pharmacological agonist (a substance that initiates a physiological response when combined with a receptor) of LXRs to normal mice is able to stimulate myelin genes expression in the cerebellum. "We confirmed that LXRs are involved in the transcriptional control of myelin genes expression by using cultured oligodendrocytes," Massaad says. 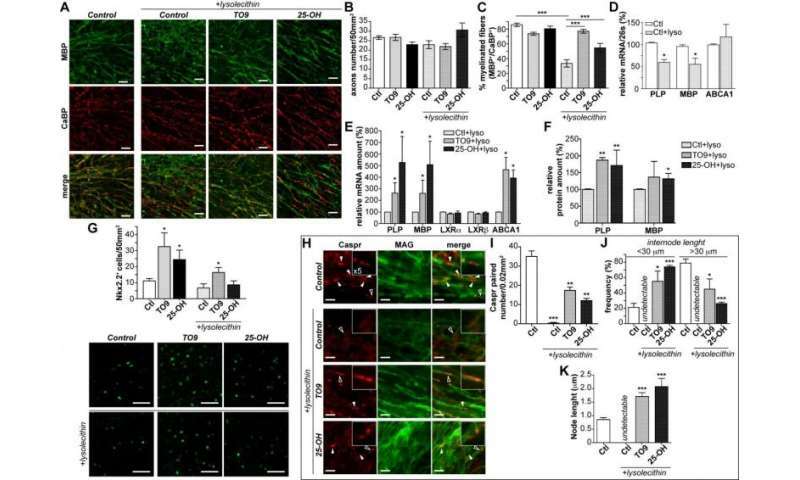 "We showed that LXRs activation led to the induction of myelin genes at the promoter level – and within demyelinated cerebellum slices, LXR activation strongly increased myelin genes expression improving remyelination process." Massaad emphasizes that the in vitro study of oligodendrocyte allowed the researchers to investigate the influence of LXR activation on the two major myelin proteins – myelin basic protein (MBP) and proteolipid protein (PLP), whose genetic expression constitute some 80% of the total protein in central nervous system myelin – which enabled them to demonstrate that LXRs are able to stimulate myelin genes at the promoter, mRNA and protein levels. Designing and conducting the investigation required a series of insights and innovations, the first being identifying and measuring high levels in the central nervous system of endogenous oxysterols – oxygenated derivatives of cholesterol produced within the body by cholesterol catabolism (the breakdown of complex molecules in living organisms to form simpler ones – by gas chromatography coupled with mass spectrometry, as well as assessing myelin ultrastructure by electron microscopy, thereby highlighting a crucial role of oxysterol receptors in cerebellar myelination. "We used cerebellar slice cultures in which demyelination has been chemically induced, taking advantage of this ex vivo model of multiple sclerosis to assess remyelination properties of LXRs using fluorescence imaging to highlight myelin sheath recovery," Massaad tells Medical Xpress. "Our work leads to a conceptual advance of LXRs and their oxysterol ligands in the transcriptional control of myelin genes expression through in vitro promoter analysis." In their paper, the scientists propose that the endogenous oxysterols are able to enhance the expression of myelin genes through the LXR signaling pathway, contributing to the basal expression of those proteins. "The main actors of LXR signalling pathways are present in the cerebellum and the brain," Meffre explains. "We detected high level of endogenous oxysterols, their biosynthetic enzyme and their nuclear receptor LXRs, suggesting a key role of LXR signalling in the nervous system." To mimic the absence of oxysterols in the brain, as discussed above, the researchers studied a mouse model in which endogenous LXRs were invalidated, leading to decreased basal expression in the cerebellum of the two major myelin genes PLP and MBP. "The resultant hypomyelination leads to thinner myelin sheaths and motor coordination and spatial learning deficits in those transgenic animals." TO9 stimulates branching processes of oligodendrocytes in vitro. Representative micrographs of mixed glial cells of PLP-EGFP oligodendrocytes cultured for 7, 9, or 14 DIV and treated with EtOH (control) or TO9 for 24 h to determine their ramified morphologies (simple, mild, or complex process outgrowth). (Scale bar, 50 μm.) Credit: Meffre, D et al. (2015) Liver X receptors alpha and beta promote myelination and remyelination in the cerebellum. Proc Natl Acad Sci USA 112:24 7587-7592. These results have significant translational implications: for example, susceptibility to multiple sclerosis is thought to have a genetic component – and although the genes involved remain unidentified, PLP and MBP (being genes coding for proteins in myelin) are strong contenders. "Oxysterols levels are altered in numerous psychiatric and neurodegenerative diseases suggesting implication of these oxidized cholesterol molecules in normal nervous system homeostasis. Again," Massaad emphasizes, "in the transgenic animals where LXRs are deleted, cerebellar related functions are altered – so targeting oxysterols and their receptors appear as a promising strategy to cure demyelinating diseases like multiple sclerosis, as well as benefitting other neuropathologies. However," he cautions, "the synthetic ligand used is not suitable for human therapy due to possible side effects – but new synthetic ligands that specifically target LXRs receptors are currently under development by several pharmaceutical companies." Moving forward, Meffre tells Medical Xpress, the scientists plan to decipher the implication of LXR in the dialogue between neuron and oligodendrocytes during myelination and remyelination processes. In addition, she says that "In both this paper and our previous works, we highlighted a dialogue between LXRs and Wnt/beta-catenin signalling pathways for myelination process." (Wnt signaling pathways are a group of protein-based signal transduction pathways that pass signals from outside of a cell through cell surface receptors to the inside of the cell.) "Developing therapeutic protocols modulating both pathways could be promising to improve central nervous system recovery." 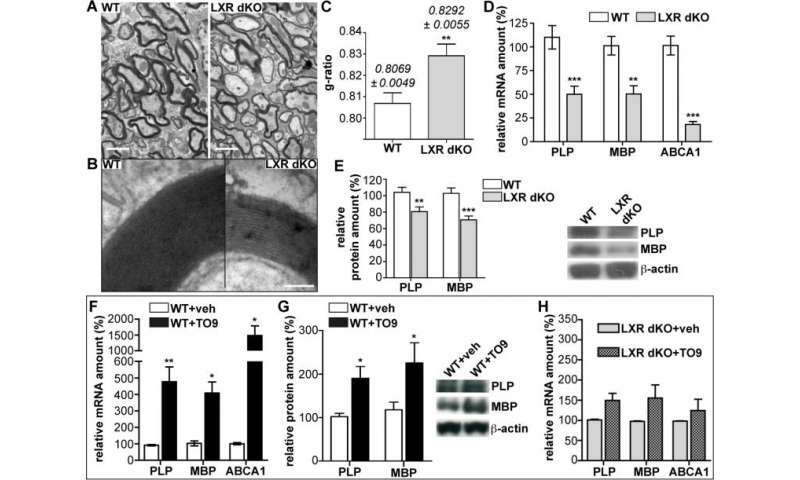 Presence of LXRs is crucial for oxysterol-induced ex vivo remyelination. We tested the implication of LXRs in the remyelinating effect of TO9 and 25-OH. LXR dKO cerebellar slices were demyelinated using the same protocol as for WT. (A) Organotypic slices of P10 LXR dKO mouse cerebellum were demyelinated and treated by EtOH, TO9, or 25-OH as for WT in Fig. 4A. After double immunostaining for MBP and CaBP, images were acquired with a confocal Zeiss LSM 510. (Scale bar, 20 μm.) Lysolecithin treatment led to a clear disorganization of the myelin network. (B) Axon number and (C) percentage of myelinated fibers were quantified with ImageJ. ***P < 0.001, analyzed by one-way ANOVA followed by Tukey’s post hoc test. n = 18 animals per group. Axon number and the percentage of myelinated fibers were not affected by TO9 or 25-OH. (D) Demyelinated organotypic slices were treated for 3 DIV with EtOH, TO9, or 25-OH (10 μM) and doubled immunostained for Caspr and MAG. No Caspr clustering was detectable after TO9 or 25-OH treatment, suggesting that the remyelination process was impaired in organotypic slices invalidated for LXRs. Credit: Meffre, D et al. (2015) Liver X receptors alpha and beta promote myelination and remyelination in the cerebellum. Proc Natl Acad Sci USA 112:24 7587-7592. From a physiological and fundamental point of view, Massaad concludes, the team's results underline the complexity of the regulation of myelin genes and unravel the implication of LXRs in myelin gene expression. "From a pathophysiological point of view, our observations open new perspectives for the development of therapies targeting LXRs for the treatment of demyelinating diseases. The identification of new signalling pathways that modulate myelination and remyelination processes is a challenging advance for pharmaceutical research into new therapeutic agents that are designed to specifically target these novel molecular actors."